This statute discusses the LRL collection and purpose, our status as a depository library, and the need for agencies to provide bibliographic information on documents. LRL is to receive all documents published by the state and considered to be of interest or value to the library. The statute defines a document as "Any publication issued by the state, constitutional officers, commissions, councils, bureaus, research centers, societies, task forces... or other agencies supported by state funds, or any publication prepared for the state by private individuals or organizations considered to be of interest or value to the library." Subdivision 1 requires that two print copies and one electronic copy of reports are to be sent to the Legislative Reference Library. Subdivision 2 requires items submitted to the library contain "the information necessary to identify the document as required by section 3.302, subdivision 3a." This includes complete bibliographic information (author, title, publisher, date, place of publication). If the report is required by a specific law, the citation to the session law and section of statute much be included. Subdivision 3 includes our mandate to provide a checklist of state documents to legislators. 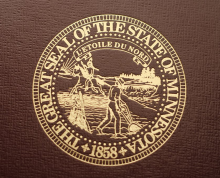 The online checklist is Newly Acquired Minnesota State Government Reports. Biennial reports required to be submitted to the legislature by various departments and agencies shall be submitted by November 15 of each even numbered year. Subd. 6, about contract terms, includes the language, "If the final product of the contract is a written report, a copy must be filed with the Legislative Reference Library." Reports to the legislature must contain a summary of the costs involved in preparation. This statute relating to the distribution of publications clarifies "...when any department, agency, or official of the state issues for public distribution any book, document, journal, map, pamphlet, or report copies thereof shall be delivered..." to the libraries listed. 13.01 Subd. 3. Scope. This chapter regulates the collection, creation, storage, maintenance, dissemination, and access to government data in government entities. It establishes a presumption that government data are public and are accessible by the public for both inspection and copying unless there is federal law, a state statute, or a temporary classification of data that provides that certain data are not public. 13.02 Subd. 7. Government data. "Government data" means all data collected, created, received, maintained or disseminated by any government entity regardless of its physical form, storage media or conditions of use. 13.02 Subd. 7a. Government entity. "Government entity" means a state agency, statewide system, or political subdivision. An appropriation act or an act having appropriation items enacted finally at any session of the legislature takes effect at the beginning of the first day of July next following its final enactment, unless a different date is specified in the act. 4410.2700 Subp. 3. Distribution of copies. The RGU shall provide copies of the final EIS to all persons receiving copies of the entire draft EIS pursuant to part 4410.2600, subpart 3; any person who submitted substantive comments on the draft EIS; and to the extent possible, to any person requesting the final EIS.